Partizan – Panathinaikos 63:56 before 22.567 fans! The world basketball capital of Belgrade, Serbia became the proud owner on Thursday of the single-game record for attendance at an indoor basketball game in European club history! 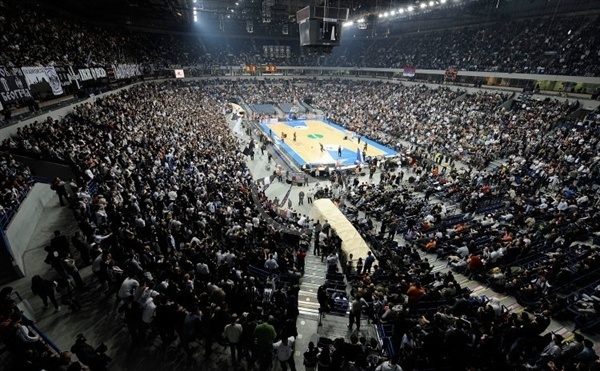 Officially, 22,567 fans packed Belgrade Arena for the Last 16, Week 5 game between hosts Partizan and Panathinaikos of Greece. Say no more… Such a spectacle was not enough for hungry Partizan – no, they had to win too! Posted in English, Partizan, Serbia, SportTagged Belgrade, Euroleague, Panathaniakos, Partizan4 Comments on Partizan – Panathinaikos 63:56 before 22.567 fans!